The Monitoring of both manned and unmanned Computer \ Server Rooms and Data Centres is today considered mandatory by most organisations as even a small down time can cause hundreds of wasted man hours by employees or customers left twisting their thumbs as they cannot access the items they require. The problem with most solutions on the market is they rely upon some aspect of your infrastructure to still be working e.g. network and internet connections for email or SNMP alerts, your internal phone exchange or VOIP systems for phone alerts or even just something as simple as power if they don’t have an integrated battery backup. This is were the M30 Alarm Dialer comes in, the M30 is a totally independent solution with various fail safes built in including battery backup, multiple phone line options & backups plus automatic test calls. Most importantly unlike most other alarm dialers on the market that are designed for domestic use the M30 is specifically designed for industrial and commercial situations. It is used by companies around the world for example Sellafield Nuclear Power Plant, Great Ormond Street Hospital, BBC, London Heathrow, London Underground, Johnsons & Johnsons, Heinz frozen foods, Houses of Parliament – UK, FujiFilm, Merial Animal Health and Coca Cola. The M30 comes with 4,8,16 and 56 separate inputs, allowing you to easily monitor various items from your computer room and surrounding building for example Mains Failure alarms, Multiple Temperature Thermostats, The alarm output on your Air-Conditioning systems, UPS alarm outputs, Security \ Access Control systems and Flood \ Water alarms. 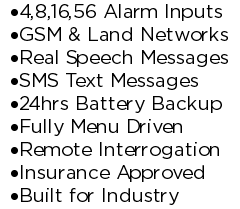 The M30 can send alarm messages by Voice, SMS, Pager or Data. You can also connect our SMS module allowing you to send SMS messages in addition to or instead of a voice call. View more Standard features and Optional features. Please also check out our other articles on protecting Computer Rooms and Data Centres.